Did I Really Just Find What I Think I Found? A few years ago my Grandma gave me all of her ‘stuff’. Four boxes – FOUR WHOLE BOXES! – of photos, albums, research, notes and various family treasures. I have looked through everything several times and I have slowly been scanning photos and documents and processing the information over the last few years. If you just thought something like this, ‘Years? Why is it taking her years?’ I totally understand that thought. And this is what happened. I got the ‘stuff’, started working with it, then had a couple of big life events slow down the process. We moved, then after years of infertility had our third baby who is about to turn two. Hence the ‘last few years’ statement. Well, in preparation for my trip, I have been scanning like crazy to make sure I have everything with me in digital form. Last night I scanned the above picture. The first few times I saw this picture I didn’t know what I was looking at. I couldn’t identify any of the people and it has nothing written on the back. But this time – THIS TIME – I spotted my 2nd great grandparents right away! They are standing in the front just to the left of the structure on the right side of the photo. He has both hands in his pockets and she has a black dog standing next to her. This time – I instantly thought these things: First, I know who that is! 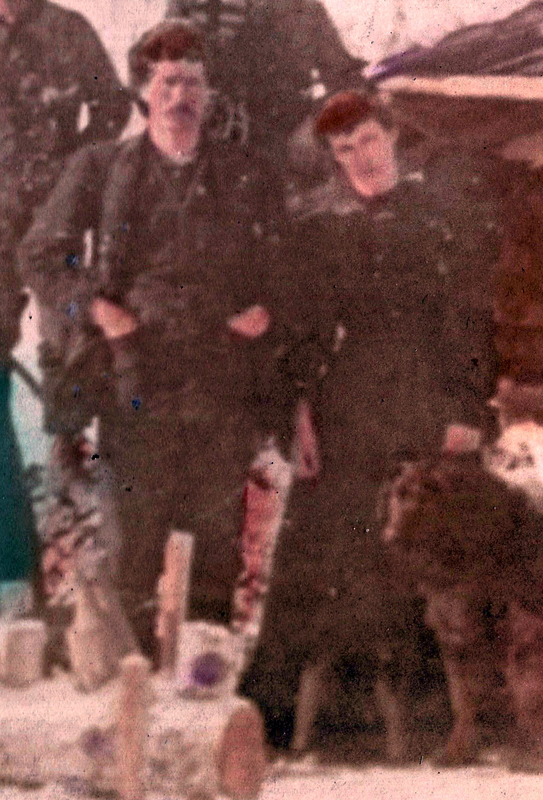 ; Second, they look younger than the photo I have of them from 1903; Third, WAS THIS PHOTO TAKEN IN DAWSON, ALASKA?!! What do you think? Same people? Okay, second question. If you concur that this is the same couple, do you think they look younger in the unlabeled group photo than they do in the 1903 photo? I’m honestly not sure why I think they look younger. It’s such a bad photo but as I said, it was my second thought when I looked at the picture. And the last, most interesting question of all – Could this photo have been taken in Dawson, Alaska during the Gold Rush? That one is going to be the trickiest to answer. 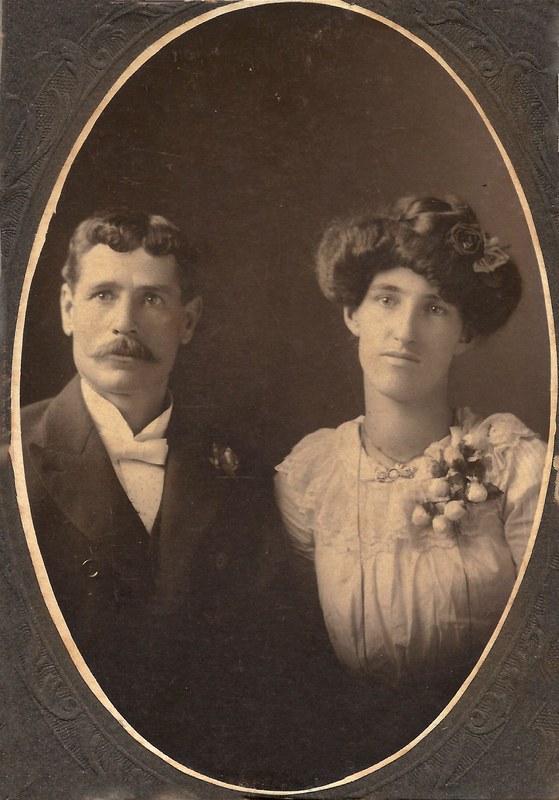 They were married in Dawson, Alaska in 1897. They had their first child Vera in Oakland, California in 1899. They had their second child Frank in Oakland, California in 1901. 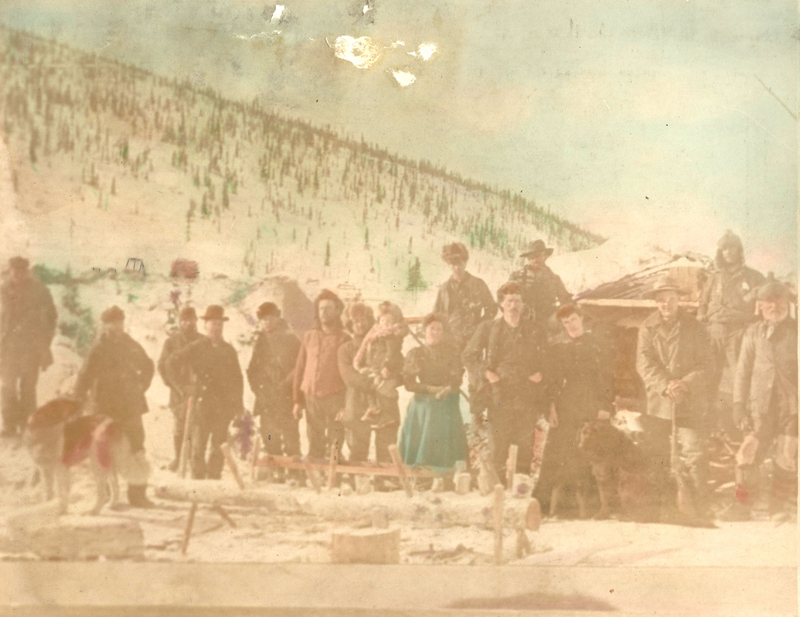 The photo is certainly consistent with what I know about Dawson, Alaska during the Gold Rush. They have no children with them in this photo. They left Alaska before 1899 and didn’t return for a handful of years. By the time they did return they had two very young children. If this photo was taken after the Gold Rush I would think we would see children with them. And, my gut is just telling me that I am right. I would love to figure out how to prove or disprove my opinion about the date and place of this photo. I’m going to try. No matter what – I was SO EXCITED when I pulled it out of the box last night! Suddenly this photo that I was familiar with had new meaning because I have been researching this family extensively this past year. I know them better now than I did the first several times I looked at this photo. First of all – I am so jealous that you had four whole boxes of stuff from your grandma! I would love to have that much stuff to look through. Years ago my ex found a hamper full of his Dad’s family stuff, photo albums, letters, all sorts of things. I loved going through it all and scanned everything in no matter what it was (even some x-rays of his grandmother’s foot after an accident.) The thing is when we broke up I was more upset about losing / stopping doing his family tree than about anything else! Sad huh? As for the photo, well I agree it does look like them and they do look younger but it is hard to tell. Although there is one child in the photo, it doesn’t mean that they didn’t have their children yet because they aren’t in the photo, but as they do look younger it seems to be more consistent with it being them pre-kids. Hopefully your grandmother will be able to shed some more light on it when you see her. Oh that is sad! Must not have been a great relationship if mourning the FH was more difficult than mourning the relationship. Yeah, can’t quite believe I stayed with him for 6 years! But you live and learn! Oh yes, his tree was fascinating, British India, mariners, death by drowning and suicides, the sillouettes, portraits I never got to see! lol all sorts! When do you go on your trip is it next week?